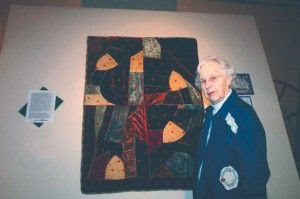 A “Crazy Quilt,” made to honor Char Kirkegaard’s birth, is on display through Feb. 6 at the Mitchell County Historical Society Museum in the Cedar River Complex. In the winter of 1931-32, Ferd and Odetta Pearson were expecting their second child. It was a cold and snowy winter on the farm eight miles from Genoa, Neb. By the new year, the snow was already several feet deep. They decided their son, Roger, 4, would stay with his aunt Charlotte and her husband. Twelve days before the birth, Ferd took Odetta to stay with her cousin, Muriel Thomazin, who lived 20 miles away in Columbus, Neb., so Odetta could be near a doctor when the baby was born. Shortly after Ferd returned to their dairy farm, the rural roads became nearly impassable. Communication with Odetta was by party-line phone. It was a week after the baby’s Jan. 5 birth before Ferd had the chance to see his wife and new baby daughter, and another ten days before the family returned home. “I was told my dad said to my mother, ‘well I suppose I should dig out the 1929 Chevy from the garage so I can bring you and the baby home’,” said Charlotte. To celebrate Charlotte Pearson’s birth, her maternal grandmother Matilda Thomazin created a “Crazy Quit” from her collection of velvets in purple, gold, and pink, with fancy embroidery outlining the seams. Thomazin had immigrated from Germany with her family when she was eight. Her father was a tailor and she learned sewing skills from him. Charlotte Pearson Kirkegaard now lives in Osage. She uses the quilt as a tree skirt under her Christmas tree every year. “My family wants the memory of what that quilt represents to live on,” she said.